Guerlinade is the famous “signature accord” present in most Guerlain fragrances; it is the presence of Guerlinade that makes the scents created by this perfume house smell magically and unmistakable “Guerlain”. In 1998, to celebrate the house’s 170th anniversary, Guerlain released the fragrance called Guerlinade; based on the legendary accord, Guerlinade has the notes of bergamot, lilac, linden, rose, iris, jasmine, tonka bean and vanilla. Having said that, paradoxically and perhaps a little disappointingly, I find Guerlinade being less “Guerlain” than, for instance, L’Heure Bleue, Mitsouko or even the gentle Apres L’Ondee. It may have been inspired by and based on “the signature accord”, but the dark, balsamic, powdery undertone of the classic Guerlain creations is strangely absent in Guerlinade. That disappointment aside, Guerlinade is a beautiful floral bouquet, incredibly, shamelessly romantic fragrance. Lilac is the most prominent note on my skin, and I always perceive the smell of lilac as being melancholy, that is perhaps why I find Guerlinade a little poignant, like a scent of love that is deep inside suspected to be unrequited, but that, because of that very lack of reciprocation, is all the more intense. Linden and jasmine are also quite apparent to my nose, both contributing to the dreamy, gauzy spring-like feel of Guerlinade. I do not smell much of tonka bean or vanilla here, there is certain sweetness to the scent, but I perceive it as a natural, God-given sweetness present in the smell of the flowers themselves. As a whole, Guerlinade has a certain “natural” feel to it, this a bouquet of flowers gathered not in a well-tended garden, but somewhere in the fields and forests, perhaps during a long romantic stroll filled with daydreaming and beautiful sadness. My feather brushed the carriage roof. I was gazing into his eyes. caused by my own sighs. in some old album, with Indian ink. *The photo is from Gazeta.ru. 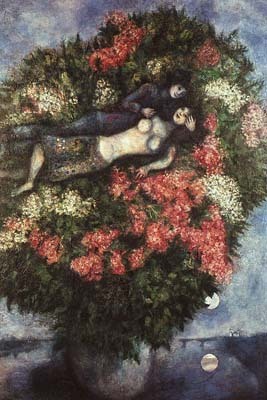 The painting is Lovers in the Lilacs by Marc Chagall. Beautiful review M! I have admired Guerlinade for years but do not care for the lilac note which is sadly too prominent on my skin. Thank you, N! I must say that I am not a big fan of lilac myself, in fact, it is one of my least favorite notes. That is why Guerlinade would never be FBW for me, but it is gorgeous nevertheless. How interesting that you perceive lilac as melancholy. It's one of the most fragrant blooms to pop up in the spring, so I associate it very strongly with sunshine and renewal. To me it's a hopeful smelling note! That said, I can live without lilac perfumes now. Ever since one of my boys discoved a bottle I have of Caswell-Massey's Lilac we've had to hide it from him. He went NUTS with it. He kept sneaking off with it and scenting his room, and especially his bed with it, to the point where it took weeks to get the infernal scent of lilacs out of the house. Sigh. And despite the thorough cleaning I gave it, I can still catch whiffs of lilac from the toy box when it gets opened up. And this happened almost a year ago now. Poor you with that indestructible lilac smell. I'd have had to move the house, lilac hater, me. Haven't been to your blog for a while. A new look I see! We haven't heard much from you on bubblenet lately! How have you been? I am ok, the little one has a cold. I actually haven't seen any bubble emails lately. Hope you are well!! Why is it that every time after I get done reading your review M.,I start searching all over the place to try and find it because they always sound like exactly what I need!! ?You have such a way with invoking perfume desires out of me and others I'm sure!It was a pleasure to read this.Thank you. Hey, you were supposed to wait until I'd finally scored a bottle before writing this up! You could have written, this stuff smells like Charlie, save yourself the $$... then there'd be more for the two of us. ;-) I need to do the full spritz tomorrow, but on first sniff I agree -- where IS the guerlinade in Guerlinade? I'm not even sure I'd guess it was Guerlain. Lilacs are a quirky thing. I find the lilacs in En Passant unbearably sad; others find them jaunty. In general lilac is one of those cheap-plastic-perfume notes that put people off, with good reason. But En Passant keeps haunting me, it's got some kind of grip on me I don't understand. So I am not the only one not smelling in guerlinade in Guerlinade! I'd have loved it to have some "skank". There hasn't been any bubble emails in a couple of weeks (since Nonna told us she has a new job) but we haven't heard much from you for a while. But maybe I haven't written much either? Sigh...It is depressing how much is lost in translation when it comes to poetry. It is depressing. There might be better translations out there of course, but...they won't be the same anyway, right? Hello I'm new here. My name is Jenny and I make perfumes for a hobby. I like the way you describe the perfumes. I love the scent of lilac so I have to try Guerlinade. I love the lilac smell in 5th avenue from Elizabeth Arden. I noticed that most of the time a lilac scent is combined with lindenblossom. Welcome, Jenny! Do you have a website, a store, or is it purely a hobby? It is wonderful to be able to create perfumes. It's purely a hobby. I do it now for 6 years. It's a long way to make a beautiful perfume. I think now I can say I start to understand how it works. But it take years of experimenting and reading about it. To make a nice blend is not that difficult, but to turn it in a perfume, is a long way of trying and trying. I use natural and synthetics and found it hard to get the synthetics I want, but now I found some places I could buy them so I am thrilled to experiment with them. Every day the whole day I'm thinking about perfumes, in my head I'm combining scents. I'm never short of ideas. I put scents on smellingstrips and try to get to now the scents. The most important study is to now how scents will react with eagother. I would love to hear from you what your "dream" perfume would be smell like. I have no store but maybe when I'm sattisfied with the perfumes that I made I will start one, you never know. 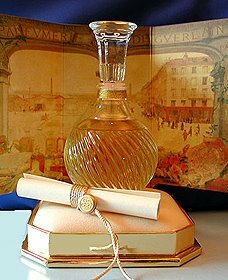 I do have a site for people who also make perfumes to discuss with them and share our knowledge. I come from Holland and couldn't find anyone who has the same hobby, so I start an international group to find them. I like the way you discribe perfumes, most people find it hard to discribe them. They just say, it smell nice or sweet or fresh etc. But you discribe them so well that you can almost smell them. I'm happy to found your blog. You are certainly not alone in being unable to smell any guerlinade in Guerlinade! It's a lovely scent (and I am very glad to have a decant), but to my nose it completely lacks the dark Guerlain accord. How odd! Thank you for your kind words and for describing your interest in perfume. It sounds fascinating but, as you said, not easy at all. Still, it is a wonderful talent to be able to do that! isn't it weird? Guerlinade without guerlinade :-) But to my nose, none of the newer ones has that dark, powdery thing going on. Which isn't necesarily a bad thing at all.